A bloom producing 'very nasty' domoic acid, a biotoxin that can cause illness, memory loss, brain damage and possibly death in humans, is unprecedented for Maine. An unusual bloom of toxic algae has closed a third of Maine’s coastline to clam and mussel harvesting and triggered a widespread shellfish recall. Last week, the Department of Marine Resources issued a recall of mussels, clams and quahogs caught in Down East Maine after samples tested positive for domoic acid, a biotoxin that can cause illness, memory loss, brain damage and possibly death in humans. A: Amnesic Shellfish Poisoning, or ASP, can occur in humans who eat contaminated shellfish. A biotoxin in the shellfish interferes with nerve signals in the brain. Severe cases of ASP can result in permanent loss of short-term memory and possibly death. A: Domoic acid is a toxin that is produced in a type of naturally occurring microscopic algae named Pseudo-nitzschia. 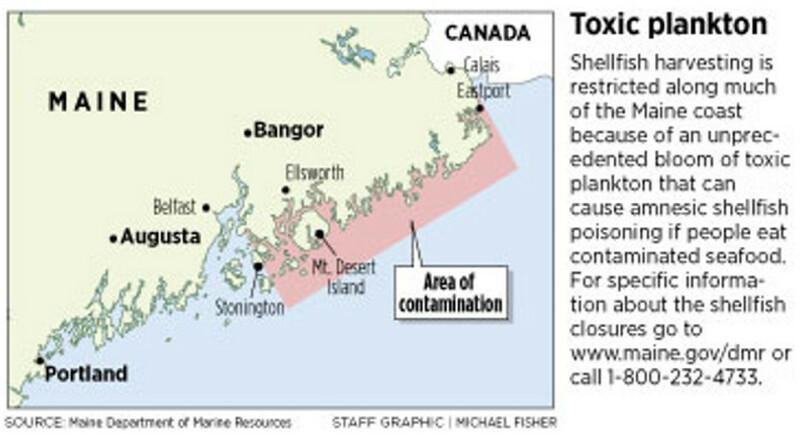 As with the more common toxic algal bloom known as red tide, shellfish eat the algae and can retain the toxin. It doesn’t hurt the clams or other shellfish, but it can build up to levels that cause ASP in humans who eat contaminated shellfish. Q: Why does it happen? A: It’s normal for biotoxin-producing algae to be present in marine water, but they are usually at very low concentrations and pose no problems. When water conditions are favorable, the algae “blooms” and reproduces. The exact combination of conditions that cause the blooms is not yet known, although such harmful algal blooms are increasing along the U.S. coasts and the increase is believed to be linked to human activities and warmer temperatures. Q: What are ASP’s symptoms? A: They include vomiting, nausea, diarrhea and abdominal cramps within 24 hours of ingestion. In more severe cases, neurological symptoms develop within 48 hours and include headache, dizziness, confusion, disorientation, loss of short-term memory, motor weakness, seizures, profuse respiratory secretions, cardiac arrhythmias, coma and possible death. Q: What should I do if I think I have ASP? A: If symptoms are mild, call your health care provider and your local public health agency. If symptoms are severe, call 911 or have someone take you to the emergency room immediately. Q: How can I protect myself from ASP? A: The state monitors for toxins and closes contaminated flats to keep affected shellfish out of the market. Both recreational and commercial harvesters should always check for shellfishing closures before collecting mussels, clams and other shellfish. For specific information about the shellfish closures, go to www.maine.gov/dmr or call (800) 232-4733. Sources: Washington state Department of Health and the National Oceanic and Atmospheric Administration. At the same time, the state banned harvesting for mussels, clams, oysters and carnivorous snails on parts of a wide swath of coastline from Deer Isle to the Canadian border. This is the first time an algae bloom producing toxic domoic acid has occurred in Maine, although low levels of the toxin have been found in shellfish for decades. Some recent mussels and clams showed domoic acid levels of up to 100 parts per million, five times the level considered safe for human consumption. “A closure for this toxin in eastern Maine is unprecedented, that is not anything anyone has ever seen,” said Darcie Couture, a Brunswick marine scientist and former head of the state’s marine biotoxin program. The Department of Marine Resources isn’t sure what triggered the bloom, how long it will last, or what other species might be affected. This week it started precautionary testing on quahog, Jonah and rock crabs, urchin, whelk and lobster in the affected area. The recall affected mussels and quahogs harvested and stored around Jonesport and clams harvested from Gouldsboro to Jonesport. About five tons of shellfish, 96 percent of the affected product, were successfully recalled, Nichols said. The recall affected five Maine companies, and contaminated mussels made it to retail stores in Georgia, Massachusetts, Missouri, New Jersey, New York and Utah, the DMR said. Soft-shelled clams were found only in Maine and mahogany quahogs were limited to Massachusetts. There is no way to trace the product that wasn’t recovered because it was not sold through retail outlets, Nichols said. There have been no reported illnesses from the contaminated shellfish, the department said. The recall and closures have been a financial blow to Down East harvesters and shellfish dealers. “Anytime there is something in the news about the safety of shellfish, it affects the market,” said Albert Carver, who owns A.C. Inc., a shellfish dealer in Beals. He would not specifically say how much product was affected, but the financial impact was “significant.” This is the first recall Carver has had in 40 years of doing business. Dealers and harvesters are accustomed to closures, usually for toxic algae blooms known as red tide that can cause paralytic shellfish poisoning. But no one is sure what to expect this time around, Carver said. Domoic acid is produced by a marine phytoplankton called Pseudo-nitzschia that grows rapidly, or blooms, under the right environmental conditions. Filter feeders like mussels and clams eat the algae and store the toxin. The toxin can work its way into the food chain, poisoning other fish, crustaceans, seabirds and marine mammals. In humans, domoic acid can cause Amnesic Shellfish Poisoning, or ASP, named for the short-term memory loss it produces. Early symptoms of ASP include vomiting, nausea and diarrhea, but it can progress to severe problems such as dizziness, confusion, motor weakness, respiratory problems, coma and even death. An ASP outbreak in Prince Edward Island, Canada, in 1987 killed three people and sickened more than 100. While Maine has little experience with domoic acid, states on the Pacific Coast are familiar with the problem. A bloom last year stretched from central California to Washington and into Alaska. The bloom involved some of the highest domoic acid concentrations ever observed in Monterey Bay and the central Oregon coast, according to the National Oceanic and Atmospheric Administration’s northwest fisheries office. The high readings forced an early closure of the razor clam industry in Washington and Oregon last year. Tests in one area in Washington showed toxin levels of 170 parts per million in clams, more than eight times the level considered safe for human consumption. Washington shut down most of its lucrative Dungeness crab fishery last summer because the crustaceans tested at high toxin levels. In Maine, the state regularly tests shellfish at 80 monitoring sites and updates its closure maps. Currently, mussels, carnivorous snails and surf clams are closed from Deer Isle to the Canadian border. All other clams are closed from Bar Harbor to the border, and European oysters are closed from Deer Isle to Machiasport, said Nichols, the DMR spokesman. In order to open an area, there needs to be two clean shellfish meat samples, less than 20 parts per million, recorded seven days apart.